If you've never smoked anything, here's an easy way to start, by creating a makeshift smoker at home. The rub cures the salmon, then the smoke is a natural preserver so the fish should still be great eating four to five days later. We serve this moist, tender salmon at Three Blue Ducks for breakfast with poached eggs and kale, or for lunch with a salad. Cold leftovers are great on sandwiches. You can experiment with this smoking method on other fish or seafood. 1. Put the egg yolks, mustard and vinegar in a large bowl, then whisk it by hand until it becomes thick and velvety (you can also use a food processor or stick blender). 2. Slowly start adding the grapeseed oil while whisking (or whizzing) continuously – don't add it too quickly or the mix will split. Once it reaches a nice thick consistency, stop adding the oil. 3. Fold in the capers, cornichons, dill, lemon juice, zest and Tabasco, season well and store in the fridge. It should keep for two weeks. 1. Use a large pot that fits a cake rack inside with the lid on. 2. Mix the dill, sugar and salt and rub it all over the fish. Season well with pepper and set aside for an hour on the bench. 3. Put the dry hay in the bottom of the large pot and put the cake rack over the top of the hay (don't use a rack with rubber feet, or remove them). 4. 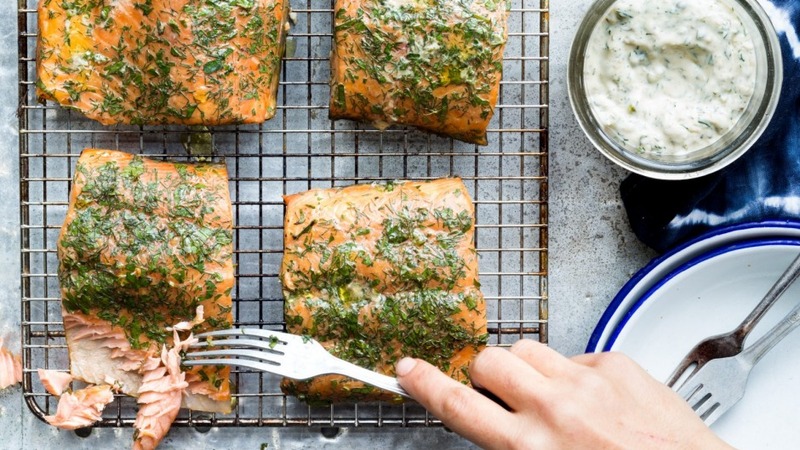 Place the salmon on top of the rack. The rub should have melted a bit and started to slightly cure the salmon. Cover with the lid and put on a high heat for 12 minutes. Put your extractor fan on high or the kitchen will get smoky. 5. Take the pot off the heat, leaving the lid on and set aside for 10 minutes to rest. The salmon should be lovely and pink in the centre and a golden colour outside. 6. Squeeze over some lemon juice, sprinkle with some zest and serve with tartare sauce.